The Blackphone is an Android handset for people who think 'tinfoil-hat-wearing' is a prudent measure, not an insult. It launched earlier this year, but now it's getting the ability to actually install third-party apps. Aww, our little baby, he's growing up so fast. 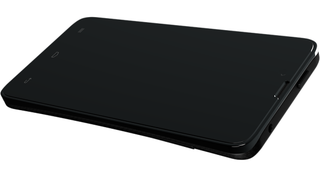 In short, the Blackphone is a nondescript (but very black!) Android handset, running a locked-down, stripped-out version of Android dubbed PrivatOS. Unfortunately, there's a slight flaw — Blackphone is only really private as long as you use the built-in apps. Download anything not approved by the Blackphone team, and all that pricey security means jack. That's the problem Blackphone is trying to address with the next version of PrivatOS, which will come with support for a proprietary app store, stuffed with all sorts of secure apps. Perhaps more importantly, there'll be the option to run apps in secure 'sandboxes', meaning you can run dodgy software, safe in the knowledge that it won't be able to steal your data or the like.